Marblehead Harbor, an established yachting and fishing community, has seen an increase in water activity. It is one of the busiest harbors on the North Shore, with over 2,000 moorings located within its waters. Situated 17 miles from Boston and east of Salem, it contains 14.2 miles of tidal shoreline. The Harbormaster Department is the law enforcement authority for the harbor and also maintains the public piers, floats, launching ramps and sewer pump-out facilities. Visiting yachts are always welcome. 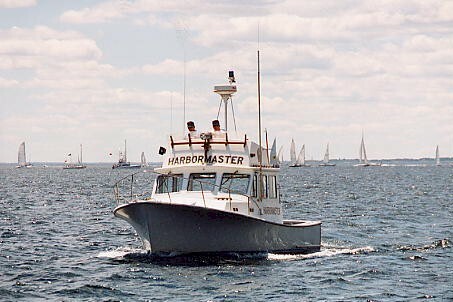 When needing float space, mooring provisions, medical services or any other assistance, they should call the "Marblehead Harbormaster" on VHF Channel 16, or the Harbormaster Office 781-631-2386. Commonwealth Communities - Marblehead Information from the Official Website of the Commonwealth of Massachusetts. Site provides official information -- community profiles, state aid (cherry sheets), official websites, and more. Marblehead, Massachusetts - The official Website of the Town of Marblehead, Massachusetts. Marblehead Racing Association - The Marblehead Racing Association was established by the Boston, Corinthian and Eastern Yacht Clubs to coordinate and foster One Design Racing in the Marblehead area.